Location! Location! Location! Private apartment nestled in highly desirable Bayou St. John neighborhood, just off Esplanade Avenue and within walking distance of the Fairgrounds; neighborhood restaurants, coffee shops and bars; and Bayou St. John and City Park. Spacious, fully furnished apartment boasts original early 1900s architecture paired with modern amenities and a backyard space that feels like an outdoor oasis. Perfect for Voodoo Fest, Jazz Fest, Mardi Gras, or a weekend getaway! Close to everything! Secluded apartment with private backyard, just steps away from everything that NOLA has to offer. Includes one bedroom with queen bed, and a queen-sized sleeper sofa in the living room. 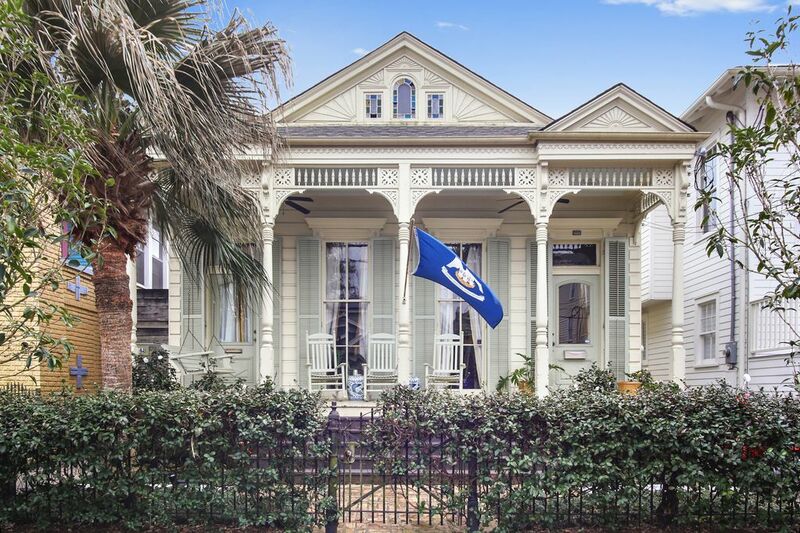 This historic gem is centrally located within close proximity to all neighborhood attractions and amenities and is only a short ride (5-15 minutes depending on your destination) from New Orleans’ famous French Quarter, the Marigny and Bywater neighborhoods, and the Central Business and Warehouse Districts. The Lower Garden District and Uptown are a short drive as well. Apartment is accessed via separate gate and entrance. Apartment is quite spacious and includes its own (fully furnished) kitchen with updated appliances and ample counter space, as well as its own washer and dryer (along with detergent, dryer sheets, iron, and ironing board). All basic necessities supplied, including utensils, cookware, dishware, and glassware; coffee, cream, and sugar; and olive oil, salt, and pepper. Apartment offers free Wi-Fi, a flat-screen TV with DIRECTV, and a bluetooth speaker for easy hookup to your cell phone or computer. Bathroom comes stocked with all necessary linens; a blow dryer; and soap, shampoo, and conditioner. There's even clawfoot tub! Apartment is accessed via separate gate and entrance, both with key codes, and opens to private backyard with elevated sky deck with outdoor seating. Guests are welcome to use sky deck, but grill(s) and shed storage are not for guest use. Owners live on property and are available by phone or email for any questions or issues. Also available and ever-ready with local recommendations. Two dogs live on property. Very friendly and primarily indoor dogs, but they are flight risks so we ask that guests make every effort to keep all gates closed. Detergent and dryer sheets provided. Free street parking available on first come first served basis. No permit required. Basic necessities provided - salt, pepper, olive oil. Coffee, creamer, and sugar also provided. Fully furnished kitchen with ample counter space. Apartment opens to backyard space with elevated sky deck. Very nice apartment close to the french quarter - can actually walk or grab a bike from nearby rental stands. Clean and inviting. Host was super helpful with clear instructions for arrival / getting inside and very responsive with questions. Street parking was easy to find very close to the house. Great place to stay - charming, modern, and peaceful retreat! We were here for 5 nights, and really lucked out in finding this place. It's located near cool, good restaurants and great places to visit--the Jazz Festival, Art Museum and City Park are all within walking distance. Laura and Andy are very thoughtful hosts who provided literally everything we could have needed to make our stay comfortable. The apartment was very clean and the decor is modern with some fun New Orleans art. The apartment is located in the rear of the house, and has its own private entrance. Being off the street made it quiet and peaceful after days of enjoying New Orleans. The Creole neighborhood is safe and fun to walk around, and we had no trouble finding nearby parking on the street. Laura and Andy have put together a terrific guide to local restaurants and things to know, and were available throughout our stay for anything that came up. This is an outstanding place to stay! When we return to New Orleans, we hope to be able to stay here again. We loved our room! This was our 1st time visiting New Orleans. We could not have picket a better room or location! The house is very centrally located to many must see sites. The recommendations that were suggested were all great! We would highly recommend this location. The hostess was amazing. The home was amazing. The dog was cute as heck. Beautiful, Quiet New Orleans Charm! My husband and I drove down and stayed in this lovely apartment. The space is well-appointed and super clean. I especially appreciated having the washer and dryer in the unit. Communication with the host and instructions on how to enter the property were both terrific. Street parking was ample and the neighborhood is very safe - we walked around quite a bit throughout our stay. As others have mentioned, it's about a $10 Uber to the Quarter, and every single driver we had was a hoot. We'll definitely be back when we're in NOLA again! This was such a great place to stay. The neighborhood is great. I enjoyed walking around the canal and the park. Laura was great, there were really no hiccups. The rental was great and well maintained for a centuries old house. I definitely recommend.